Don't have a pocket for your key or kleenex? 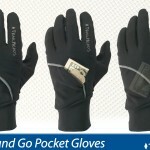 Don't worry, when you have these gloves! They have a pocket! Excellent for runners and riders. Convenient pocket feature is the highlight of this form fitting style.